This was a proper page-turner and although I admit to working some of it out quite quickly, it still had a few surprises up its sleeve so it didn't spoil my enjoyment in the least. 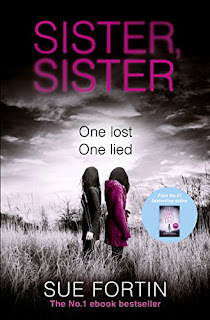 I love the suspenseful and gripping writing of Sue Fortin and think Sister, Sister is as good as, if not better than, The Girl Who Lied, Sue's previous book which I absolutely loved. Clare is happy with her life but a part of her has always been missing since her dad took her little sister Alice on holiday to America and never returned. Clare and her mother were devastated and tried desperately to find Alice, to no avail. They never gave up hope that one day they would be reunited, so it's a dream come true when they receive a letter from Alice. Alice proposes to visit England with her friend and Clare counts down the days until she can see her sister again. At the airport, Alice arrives alone and has conveniently forgotten her photo album which makes Clare a bit uneasy. Clare tries her best to welcome Alice into her family but something just doesn't feel right and Clare's family put it down to jealousy. As Alice gets her feet more firmly under Clare's table, it is Clare who is pushed out into the cold and even Clare's husband take's Alice's side. The only person who will listen to Clare is her colleague and old friend, Tom, but Tom is harbouring unrequited feelings for Clare so it suits him just fine when Clare is ostracised from her family. Clare won't give up without a fight so she starts to dig into Alice's background, but she has no idea what skeletons she is about to unearth. Sue Fortin has such an enthralling writing style that it makes the pages turn effortlessly. The reader can't help but become engrossed in the story as you follow the trail of breadcrumbs that are scattered throughout the pages. Many times I thought I knew what was going on, only to find that the story took a swerve in a completely different direction. Although Sister, Sister has some similarities to other books in the psychological genre, there are enough surprises in store to make this a 5 star read. Vicki, you should definitely check this one out. It explores sibling love and jealously perfectly.